There are currently 9 users and 4199 guests online. Headed out yesterday in hope of some inshore fun after the ugly weather, and i quickly realised that it was gonna be a tough day. The weather was a little sloppy and the bite was almost non existent with not even wrass hittin the placcies ( not sure weather the moon had anything to do with it ) but it was shut down. So after an hour of searching around i found a new little lump in 14m and set about flogging away with the placcie. Nothing hit the placcie so not satisfied i dropped a small jig which quickly resulted in a small dhu 48cm. After the release i set back up with a paddle tail placcie on the drift and as soon as i clicked the bail over it was smoking kicking up 3 gears before deciding to slow and turn a tense battle resulted in a solid 80cm pink being netted and in the cooler bag. The rest of the day was pretty slow with undersize fish and a few more wrass. 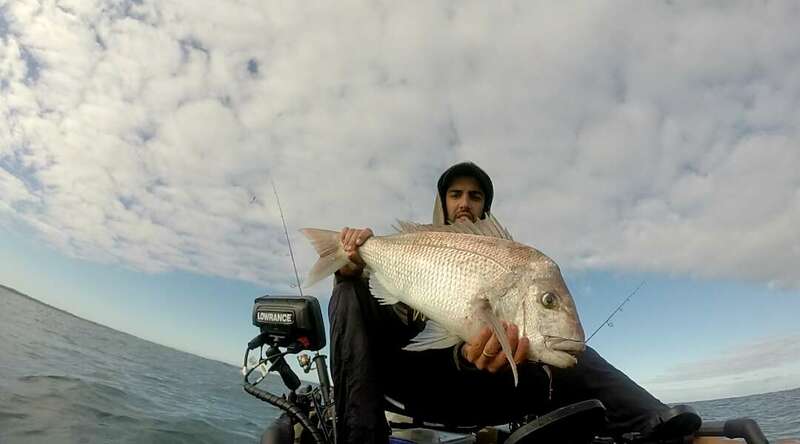 A mate got a 60cm dhu and another mate bagged out on blackass. But it was slow going. Interestingly when i got home the pinkies gut was jam packed full of kelp and sand. Strange or normal? We saw heaps of fish on the sounder but they were very shy. I scored one nice pinky at 75cm, my bro got an undersized one and we were unlucky to miss a few good takes. Are you the guys that were setting up your kayaks at Two Rocks at first light? Apparently you live near my bro Ashley and you were the kayak we passed near the marker on way back in. He was just telling me about you! Yeah he mentioned you guys saw me. Yeah i had a bit of boat envy seeing ya head by me. Cheers Haha you dont get wet in a pa12 like sitting in a recliner chair.